Collections Manager, Bill Hopkins, in his office. 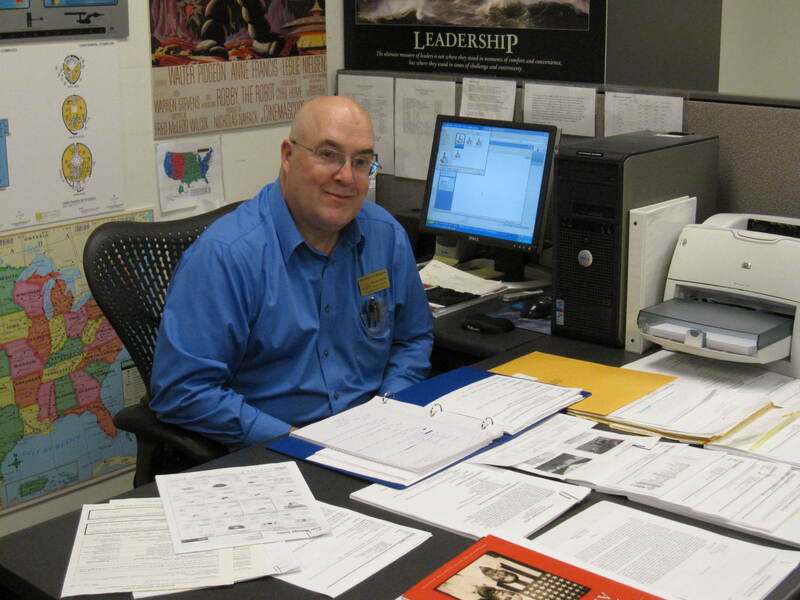 The Accessioning Department of the American Heritage Center consists of the Collections Manager (William Hopkins), one full-time Processing Archivist (Mary Ann Meyer), and a rotating number of student workers who are responsible for a wide range of duties pertaining to the documentation, use, and safekeeping of the Center’s archival collections. 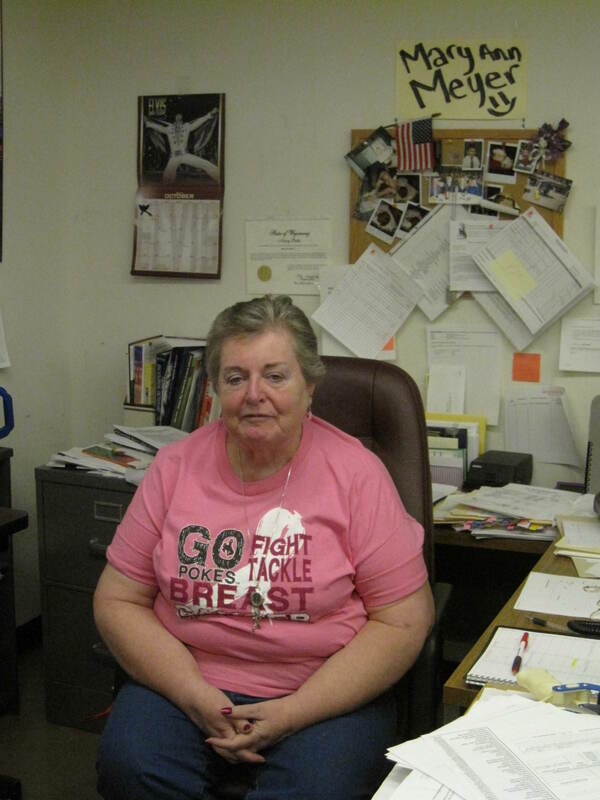 Archival Processor, Mary Ann Meyer. 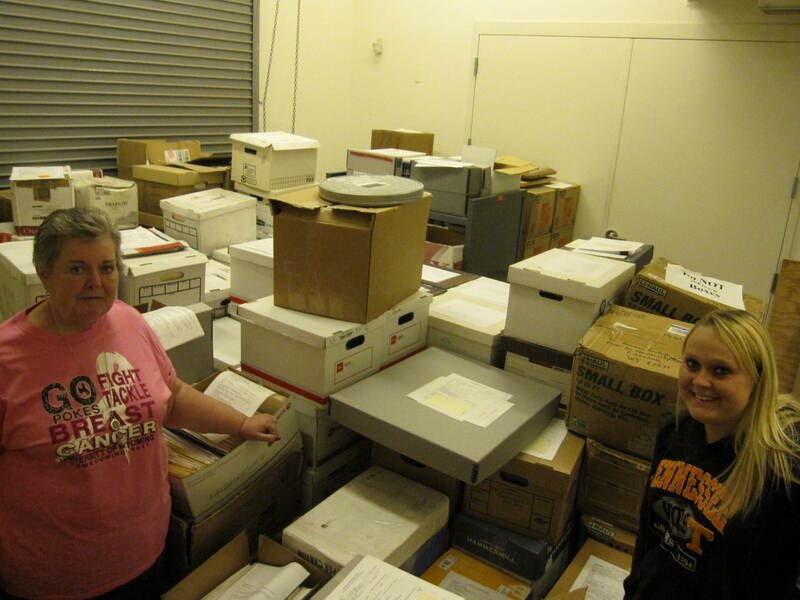 Currently, the American Heritage Center receives between 600 and 1000 cubic feet of new archival collection material each year, and all of it passes through the Accessioning Department. As the recipient of all new archival collection material arriving at the Center, whether its via outside shipping companies, the postal service, or personal delivery, the department assists collection donors, and the archivists working with them, in selecting appropriate material that’s in compliance with the Center’s collecting policies. Once a decision has been made on what to donate the department then assists in preparing and shipping the material, and upon arrival examines and verifies the contents and notifies the donor that the material has arrived. Mary Ann Meyer with Katelyn Barber, one of the Accessioning Department’s student assistants. They are standing in the temporary storage areas where new collections are initially assessed and assigned a record so that they can be used by researchers, even before they are fully processed. As the first onsite department to have contact with collections as they arrive at the AHC, the Accessioning Department is also responsible for examining new collection arrivals to determine the possible presence of problematic and even hazardous materials which should not be admitted into the Center’s collections holdings. If such material is identified it’s then the responsibility of the Collections Manager and Accessioning, in consultation with the relevant archival or conservation specialists, to determine how this material will be dealt with. Additionally, the department establishes the initial intellectual and physical control over incoming collection material (recording legal documentation, assigning collection names, accession numbers, accretion trailers, etc. ), creates and distributes basic finding aids for use by the Center’s patrons, and then re-boxes, numbers, and assigns the collection material to the appropriate archival storage area. The department also inputs all of the information its gathered into the Center’s internal database thus creating an important contextual framework which will support and guide all future work both with and on the collection. The Accessioning Department also assists the Collections Manager in the long-term storage and care of the archival collections, in monitoring retrievals and returns from the archival storage areas by other AHC departments, and in maintaining (both mechanically and environmentally) the Center’s nearly 100,000 cubic feet of archival storage areas. It also prepares collection material for exhibit, both internally and externally, and for loans to other institutions. Finally, on those occasions when a collection is deaccessioned by the Center’s Acquisitions Committee, the Accessioning Department is responsible for coordinating the return, transfer, or disposal/destruction of the material. It also oversees the updating of the Center’s internal records so that documentation regarding the fact that the collection has been deaccessioned, the rationale behind the decision to deaccession, and the ultimate fate of the collection is properly created and appropriately filed.